Tis the season to be jolly and to drink a brandy flip variation! Holidays to me are all about the egg drinks! So decadent, very festive and perfect if you love boozy egg nog! A flip is a class of cocktails that can be interchanged with almost any spirit. The first mention of the term "flip" as a cocktail term was in the Oxford English Dictionary in 1695 to describe a concoction of rum, sugar, and beer that was heated with a red-hot iron rod, "Thus we live at sea; eat biscuit, and drink flip". The iron caused the drink to froth and flip and there you have it! The next mention of a flip cocktail was in the famous, Jerry Thomas' 1862 How to Mix Drinks; or, The Bon-Vivant's Companion and the best part of his recipe eggs were added! Whole eggs, egg yolks or egg whites make any cocktail extra delicious! A flip cocktail only contains the whole egg or just the yolk...egg whites would be a sour or fizz and that's another blog post! So go for it! It is completely safe when using fresh eggs and shaken up with alcohol. This Italian Brandy flip variation is the perfect thing to serve at any holiday gathering. Family and friends alike will jump for Christmas joy after this cocktail! Take out your shaker tin and add all ingredients and dry shake/whip everything together for around 8-10 seconds. Then add 4-5 medium sized ice cubes and shake vigorously for 10-15 seconds until shaker tin is extremely cold and has a bit of frost on it. Then take your hawthorne strainer and fine strainer and strain the cocktail out and up into a cute footed glass like a coupe or Nick and Nora or like I have below. Then with a dry fine strainer lightly sift a mixture of cocoa powder and powdered sugar over the top of the cocktail not too little and not too much and there you have it! Ciao Bella! Lazzaroni Amaretto: Created in 1851 by Palol and Davide Lazzaroni in Saronno, Italy it is made made from an infusion of their famous Amaretti di Saronno cookies. Delicious! 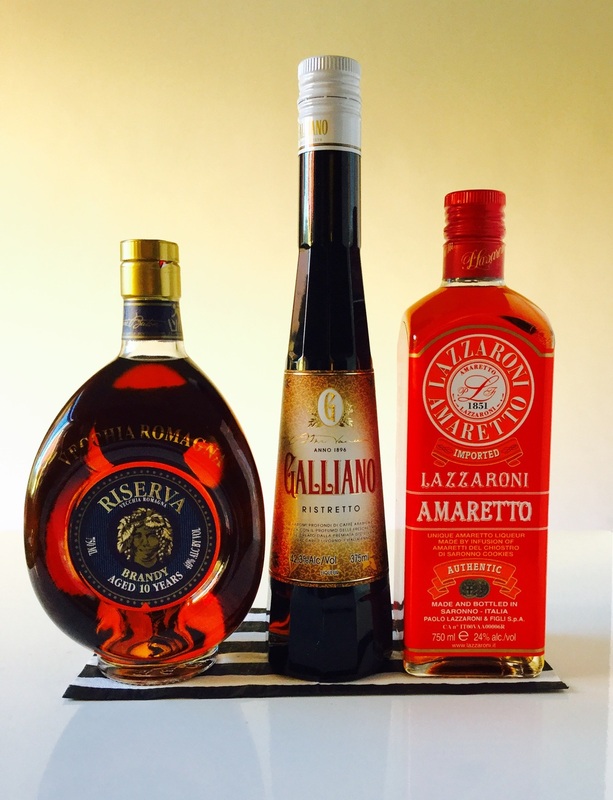 Galliano Ristretto: A delightful espresso flavored liqueur from legendary producer Galliano made in 1896. Made using a combination of strong and bitter Indian and Kenyan Robusta beans and creamy chocolate notes from the Brazilian and Colombian Arabica beans.